9 guests in the Center! 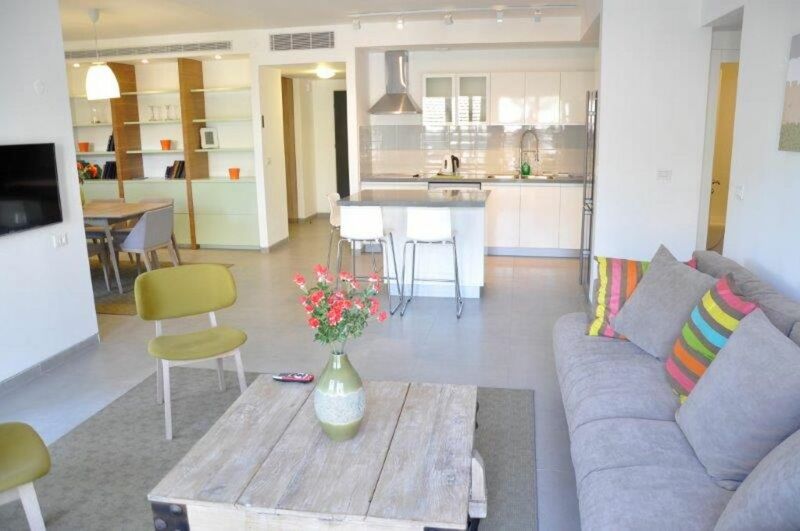 This charming new apartment is Located in a quiet street, very closed walking to famous Mamilla Mall, Ben Yehuda street and animated downtown. Enjoy the comfort, the kosher kitchen and Its bright terraces! Everything is combined to a successful stay! 2nd floor (with elevator and Shabbat elevator) of a luxurious Jerusalem stone building, so you can enjoy the tranquility of the alleyway, while Being to the center of the city and Its animations. The building: has a permanent security, a very nice lobby and a private parking garage. The apartment is a broad new 110m2, very comfortable and bright. It has 3 bedrooms: the first one and the second with a king size bed and balcony, and l'autre one four single beds. More sofa bed in the lounge. 9 beds in total. Each room is equipped with closets. The living room is nice and comfortable, ideal for relaxing in front of the flat screen TV with cable. The kitchen is fully equipped kosher. Possibility of a normal kitchen. You have available the dining room, American bar to sit down with family or friends. And nothing like a breakfast on the terrace! The apartment aussi: has a laundry washing machine and dryer. good location. Ample space for large family. Friendly. The apartment was great, in a great location right off Ben Yehuda and Jaffa Rd. Menachem could not have been nicer - he met us to check us in, showed us around the apartment. It had everything we needed, comfy beds and linens, two patios, well stocked kitchen and Menachem even left us Nesspresso pods for the mornings. Location location location - can’t be beat. You can walk to the old town of Jerusalem or two blocks away is a major street with shops and restaurants. Beautiful new apartment building with a doorman and it was very clean. Balcony is nice too. Easy contact with apartment owner/manager and very responsive. Would definitely stay there again. Rebecca and her family are exceptional. Facilitation in communication, comprehensiveness and clean. They took care of the apartment and left it tidy and clean. I highly recommend this family! We really enjoyed our stay - there's nothing not to love about this flat. Location is fabulous - walking distance to the Old City and right by the tram stop. Parking is included and under the building. Very spacious (we were a family of 6 with 2 children) and well appointed. Nick and his family are exceptional. Wonderfully spacious and very well maintained. Best of all, the location was amazing. Menahem took good care of us and made sure we were well taken care of. This was a great apartment for our family of 5. The location can't be beat - 15 minute walk to the old city, 15 minutes to a fabulous open air market and 5 minutes to a fun, trendy part of town. The apartment was clean as as described. Menahem was responsive and the various security guards/doormen were friendly and able to answer our occasional questions (like how to find an open restaurant on Shabbat and how to get a taxi to the air port after our shuttle failed to arrive). Shannon and her family are exceptional !